Rob has kindly put some pictures in "photo mysteries" for me. Can any of you motorbike experts identify either of the 1930's motorcycles that My step-grandad is riding ? Hi Anne - I'm more a car man but hopefully a more dedicated 'biker' will come along but I think the top photo might be a Coventry Eagle motorcycle. The 'VC' registration is certainly a Coventry registered location plate. I'll keep researching! Certainly looks similar. Hi, The bike VC 6135 was registered between Mar '29 and Nov '31 (Coventry). 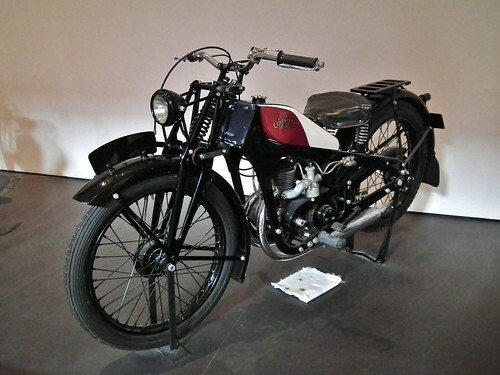 The bike EFC 433 was registered from 1937 (Oxford series). I've just asked over on the Francis Barnett forum for help as there's some very knowledgeable guys on there. Shouldn't be too long before you have an answer. Steve. As I thought John Harding, the Vintage Motorcycle Club's Francis Barnett marque expert has come up with the following: EFC 433 is a circa1936/1937 Ariel, probably a 350 looking at the relationship between the pushrod tubes and the barrel finning, probably an NG 350, last year of the open valve springs, bashplated up for competition work. I can't see enough of VC 6135 to be sure, but it's a twin port 2 stroke and from the style of the silencers and rear stays, I would have my money on Velocette GTP 250cc. John H regards, Steve. Anne, I copied your reply on the FB forum and John Harding has added the following: Always glad to help Steve,having googled some pics of early Velocette GTP's I am now almost certain that is the second bike (VC), looking at the way EFC is kitted out it was probably used in both trials and scrambles, at that time the tyres would have been the same for both, usually either Dunlop Sports or Avon Gripsters, the block tread "trials universal" not being forced upon the trials fraternity until much later, to standardise the tyres used and to appease the footpath users who claimed the "knobbly" tyres were ruining footpaths/walkways, John H..
Not exactly an instant response, but the motorcycle spares shop in Foleshill Rd referred to by Fidobsa was run by Bob Bull. It was situated in a big house on the corner of Blackwell Rd. I think that he eventually had to leave because the landlord objected to the vast weight of bike bits stored in every room and under the floorboards on the ground floor. The combination of the excessive weight and an old house in poor condition posed the very real risk of the whole lot falling down. In later years the whole property was refurbished and happily still stands today. I remember Bob Bull's "Spares and repairs". It didn't matter what second hand part you wanted for a British bike, he had it. In later years, it became Coventry Cartridge Centre, and I was told it was still his business, and that he was now running a gun shop. (Ironic that BSA and Royal Enfield made both motor bikes and guns.) He lived in Pauline Avenue, Bell Green. I remember because he was in the local paper and was in some sort of trouble; can't remember the details, whether it went to magistrates' court, or whether it was a dispute with the council or the neighbours, but it was because of something he'd done. Or perhaps hadn't done.